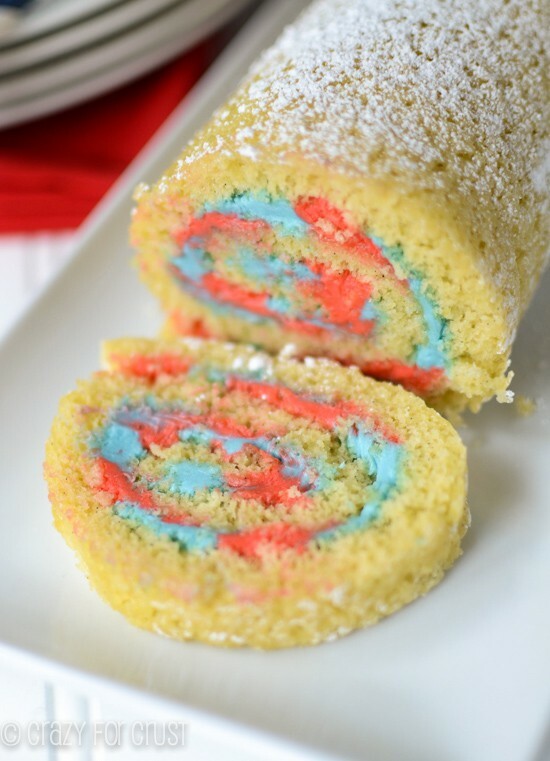 This Patriotic Cake Roll is perfect for the Fourth of July. With it’s red and blue filling, your friends and family will be wowed by your presentation! Picture it: California Adventure Park, early afternoon, summer. The Tower of Terror ride, outdoors, an hour wait. All the snaking turns in the maze of the lines are full of hot, sweaty, irritable people and scared-of-whats-to-come children. I had been waiting in line about 20 minutes, by myself. My family (read: Jordan) did NOT want to drop from the Tower of Terror and I really, really wanted to ride it. All of a sudden, I hear heated words in front of me. I hear the the b-word and, at first think being said funny, like you’d talk to your girlfriends. Then I realized the people didn’t know each other. There was a trio of people standing in an exit row, waiting. They had come in the wrong gate, thinking it was the line, and then realized they were in the wrong place, but wanted to get in the line where they were. Because, obviously, the snakes of people and the huge TOWER OF TERROR sign above the actual line entrance was easy to miss. The people they asked first declined them passage in front of them. They told them where the back of the line was…and encouraged them to find there way there. That’s when “you don’t have to be such a b- about it” was slung, by the cutters. And when I say cutters, I mean middle aged women, not teens who you’d expect that from. It just went on from there. There were kids with the lady who’d been called names. She wasn’t too happy to have been called a b in front of her kids, let me tell you that much. At that point I tweeted my adventure, of course. I mean, could there be a better gift for me from the Disneyland Gods? I almost took out a pen to start transcribing the event on my arm but figured that would be too conspicuous. Welcome to the happiest place on earth, where standing in the hot sun with 1,000 strangers will make you want to cut a b-! I mean, cutting in line at Disneyland is not only something we learned was wrong in Kindergarten, but it’s kind of Un-American, right? Politeness and all that? Whatever, I was looking for a segue to this Patriotic Cake Roll. Something that is easy, and makes you want to cut it…in a nice way. Ever since y’all practically mobbed me when I made my Carrot Cake Roll, I’ve been trying to come up with some good new combos. 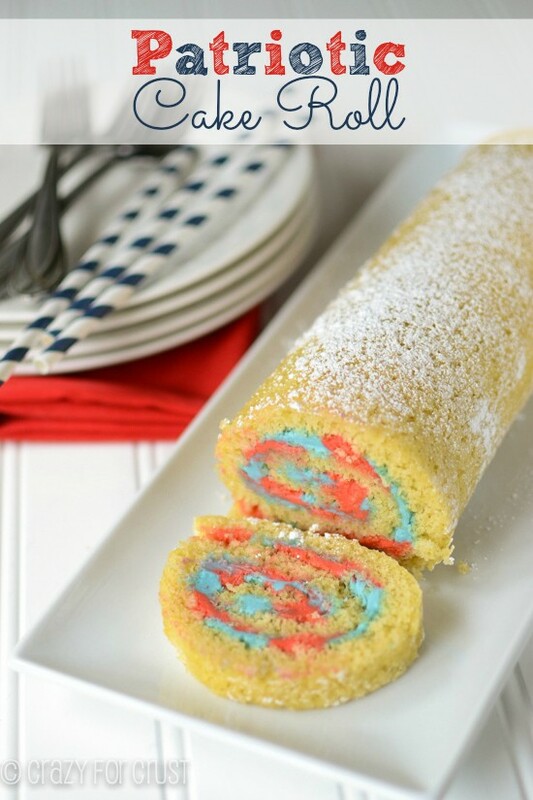 I have SO many ideas for cake rolls. 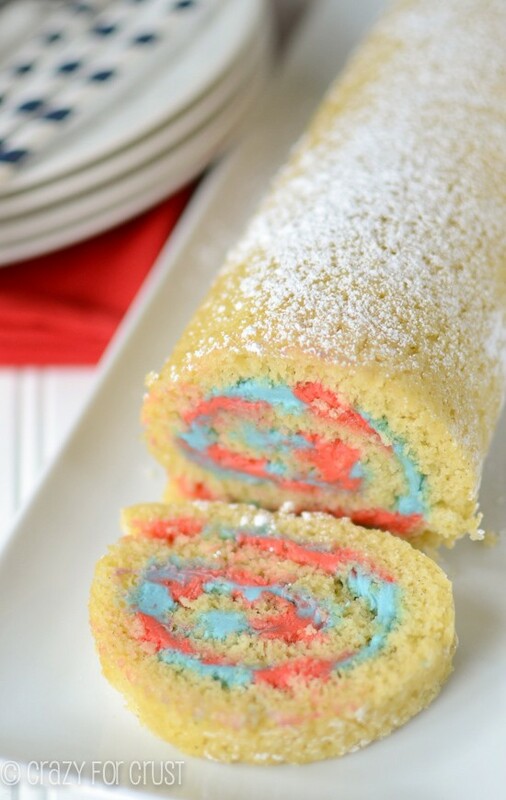 This Red, White, and Blue Cake Roll is so easy to make. I made a basic vanilla cake to pair the red and blue butter cream with. If you need a step-by-step instruction on how to roll the cake, check out this post. Once your cake is rolled and cooled, you’re ready to frost. This is where it gets fun! I added my colored frosting to piping bags and piped stripes down the cake. Then I spread them slightly with an offset spatula and re-rolled my cake. Let’s talk food colors for a minute, okay? Please, do not use the food coloring from the grocery store. You could use that food coloring for the blue, but definitely not the red. You need to head down to the craft store and get yourself some Gel Food Coloring. Wilton sells it but my favorite is AmeriColor. Either brand works fine, but you basically can not get a red colored frosting from the basic grocery store food coloring, unless you use the whole bottle. I used a few drops of Super Red for this frosting and it’s still not true red – so believe me. It’s worth it to get the gel food coloring. I love the red and blue pops in this cake. It screams Fourth of July, which is probably my favorite holiday! The cake is a soft vanilla cake. I used whole eggs, which gave it more of a yellow color. I also used vanilla bean paste – but you can substitute vanilla extract if you don’t have paste. You should totally get some Vanilla Bean Paste though, if you can. They sell it at stores like Williams-Sonoma and Sur la Table, but you can also sometimes get lucky at Ross or Homegoods or those types of stores. It’s totally worth the money, and gives an amazing flavor to the cake. 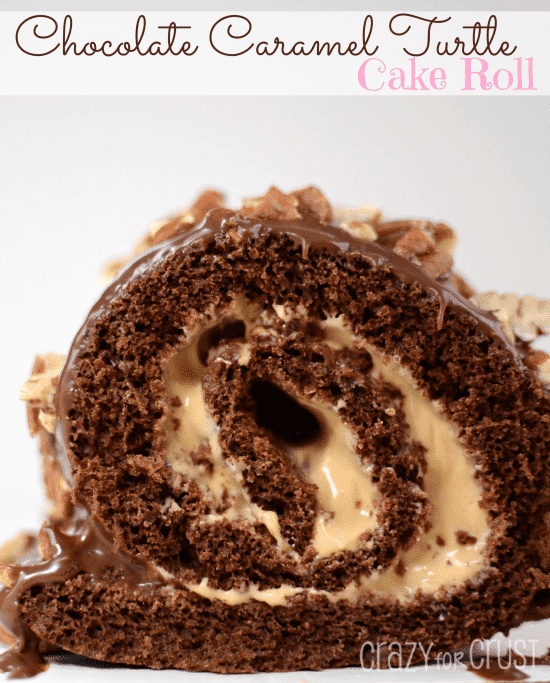 Don’t be scared of cake roll recipes. They really are easier than you think. They’re perfect for parties, especially when they’re dressed up all patriotic. And the cutting will inspire oohs and awwwws, not bad words and ugliness. What kind of cake roll do you think I should make next? 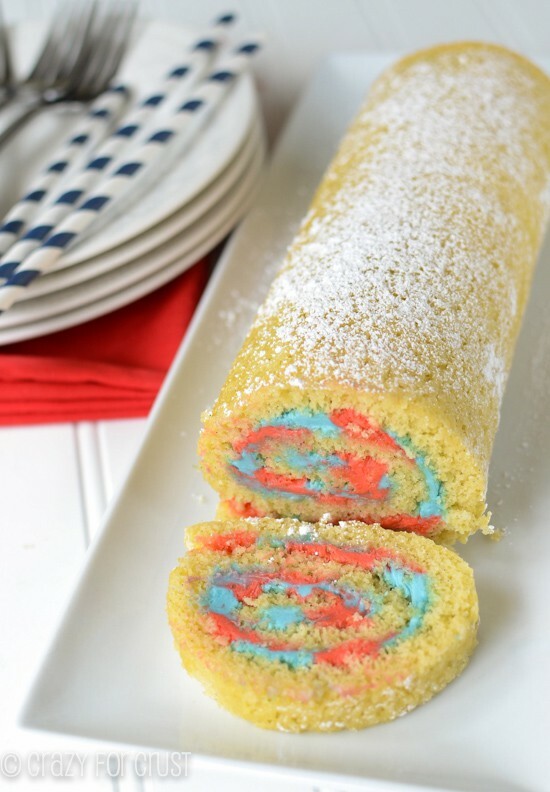 A vanilla cake roll filled with red and blue filling for the 4th of July! Preheat oven to 350 degrees. Line a jelly roll (10x15”) pan with foil and spray with cooking spray (I like to use the spray with flour). Beat eggs at high speed for 5 minutes, until frothy and dark yellow. Beat in sugar, oil, and vanilla extract. Whisk together salt, baking powder, and flour. Stir into wet ingredients just until blended. Spread in prepared pan. Batter will be in a very thin layer and you will need to use a wooden spoon or spatula to spread it to all the corners of the pan. Bake for 9-11 minutes (mine took 10). Working at the short end, fold the edge of the towel over the cake. Roll tightly, rolling up the cake into the towel. Let cool completely while rolled, at least one hour. While the cake is cooling, make the frosting. Beat the butter until it’s fluffy. Beat in powdered sugar and vanilla. Divide the frosting into two bowls. Tint one with blue and one with red food coloring. I suggest using gel food coloring, not the regular kind from the grocery store. You can find gel food coloring at craft stores! Place each color frosting in it’s own ziploc bag, for easy piping onto the cake. When cake is cool, carefully unroll the towel. 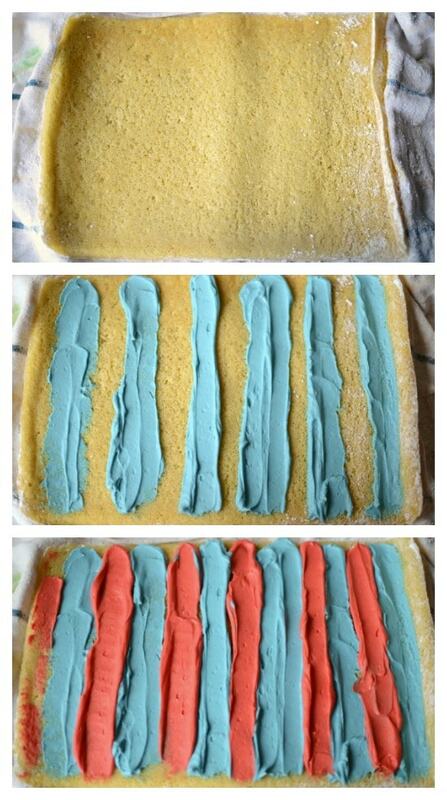 Snip the corner off the blue frosting and pipe evenly spaced stripes horizontally on the cake. Spread slightly with a knife or offset spatula. Repeat with the red. Gently but tightly, re-roll the cake and wrap it in plastic wrap. Chill until it firms up a bit, at least thirty minutes to one hour. Slice and serve. Cake can be wrapped in plastic and frozen for up to one month. 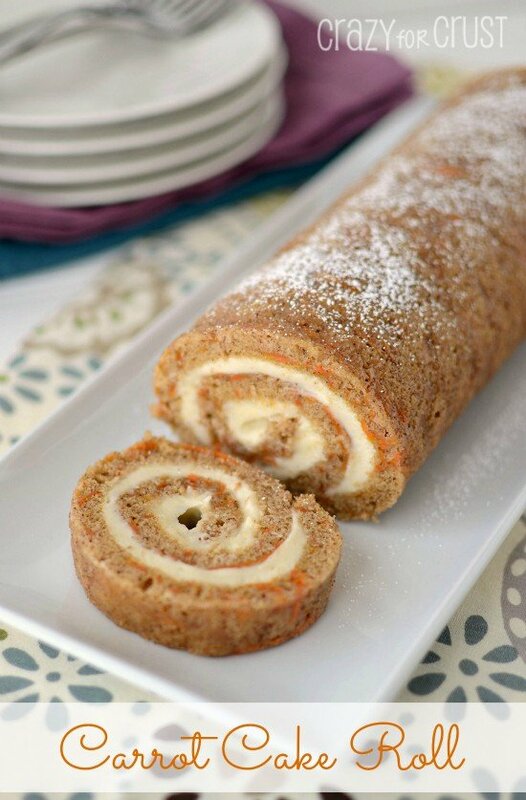 Carrot Cake Roll – photo tutorial! Oh no!! I’m sorry. 🙁 You have to do special instructions for a cake mix – the first one I made (the chocolate turtle one) was from a mix. But you only use a few cups of it, otherwise it’s too much for the pan. It’s a gorgeous roll Dorothy !! This cake is just lovely! So festive and looks so moist! Must try it!